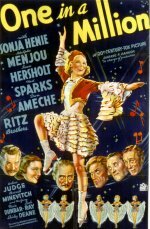 Norwegian ice skating star Sonja Henie's first American film was a smash hit which resulted in a 20th Century-Fox contract and top international screen stardom. Viewed today it is probably her best vehicle (though not her best film - that's Sun Valley Serenade, the Glenn Miller movie). There's a winsome topicality attached to this film, dealing as it did with the pre-war Winter Olympics, where the blonde cutie wins the gold and is schlepped to Madison Square Garden by manager Adolphe Menjou. There she meets likeable Don Ameche, and begins a long-term cinematic relationship with him, involving a series of money-making musicals for Fox boss Darryl F Zanuck. There are real treats on show here, notably appearances from classic vaudeville acts the Ritz Brothers and the legendary Borrah Minevitch and his Harmonica Rascals, so, even if you're not a fan of the pert ice star, or especially if you've never seen her before, give this fun flick a try - it's as good as these movies get.